Yesterday I had the incredible honor of declaring myself a reading warrior along with hundreds of other passionate nerdcampers. Thanks to the awesome Erin Klein,this Ignite/Nerdtalk from Nerdcamp 2015 is below. If you have never experienced Nerdcamp, you need to put a huge “X” in your calendar for next year. It was absolutely incredible to be surrounded by people who are as passionate about literacy as I am. We will change literacy instruction if we band together! Thank you to Colby, Alaina, Suzanne and all of the other incredible people that put this event together. PS: Due to the slides not working you will see me filling 3 minutes of awkward silence with my stand up routine – luckily I think I am better teacher than stand up. I have a love/hate relationship with that hashtag. The #ISTE2015 conference is in full swing, and I’m not there. It was my choice and things at home necessitated that I stay here. I’ve never been to ISTE, and in fact haven’t been to any professional conferences in a long time. This year my heart is aching a bit though. I decided to participate virtually by registering for ISTE Live, a way to participate in a limited number of session through webinars. Yesterday I spent nearly the entire day watching the ISTE Live sessions, connecting with other educators, getting dizzy following Twitter Feeds, following @tonyvincent’s live feed on Periscope, saving web resources, and in general being envious of all of those who were there. Today I expect more of the same. The session go by so fast but I’ve found some real inspiration in some of the speakers and their messages. Rafranz Davis (@RafranzDavis) introduced my to the power of an Ignite presentation (five minutes, 20 slides.) She spoke so eloquently about diversity. Soledad O’Brien’s (@soledadobrien) opening keynote address focused on equity of access and the true power of technology in education. Yesterday I had the the privilege of listening to George Couros (@gcouros) in his session on creating a culture of innovation. What an amazing leader! I also had the opportunity to feel like a true #ISTE2015 participant when Monica Burns (@ClassTechTips) made the extra effort to pull in the virtual ISTE Live audience as part of her presentation on wearable technology in the classroom. How excited was I when my questions and comments were repeated by her to the ISTE crowd in Philadelphia! She truly made me feel like I had a voice. Finally, Tony Vincent (@tonyvincent) has been kind enough to walk me through poster sessions, the blogger’s cafe, and the exhibit hall with his live feed on Periscope. I got to virtually meet Angela Maiers (@AngelaMaiers), Erin Klein (@KleinErin), and Jerry Blumengarten (@cybraryman1). There has been so much more and I’ll be glad when the archived sessions are posted so that I can go back and watch some again! Today will be another booked day! I never imagined that I would be so consumed by the virtual experience. Looking forward to the opening keynote by Jack Gallagher and the other ISTE live events planned for the day. Last week the fifth grade began research on the American Colonies. The lesson was promising. The social studies teachers collaborated with the language arts teachers, and me, to plan the unit. It was up to me to kick it all off. We had two sessions scheduled that day. Things were going amazingly well. The students and teachers had a conversation about research, choices, and reliable sources. We moved on to using text features to find specific information with the text. 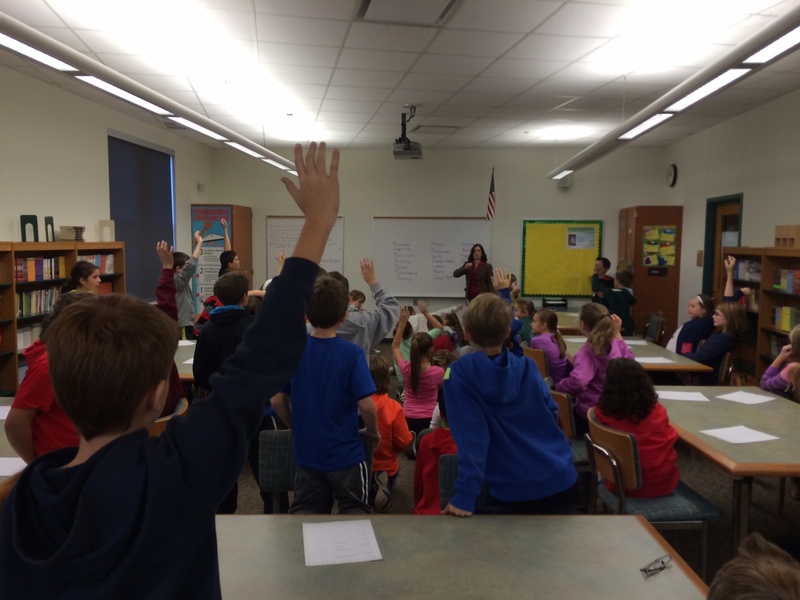 Every hand was in the air as the students begged to be able to contribute to our list of text features. Three teachers beamed at each other proudly from different corners of the room. Hooray for text features! Photo by Mr. T.
The classes were scheduled to come back in the afternoon to use the non-fiction books, and their text features, to find information that would help them better understand various aspects of life in their assigned colony (general information, government, education, industry, climate and geography, and religion.) The plan in the afternoon was to group the students at tables by colony. Three or four students would then each select a different book and examine the various text features of their book to determine how that particular book could be helpful for their research on one of the subtopics. They would then find a paragraph to read about the subtopic and read for understanding. In the last 15 minutes of class they would share what they learned about their books as well as what they learned about their subtopic. Before the classes left in the morning, as an afterthought, I explained to the teachers that I felt the students would benefit from a scaffold to help them as they used the books. In between my duties and my other classes I scrambled to have a scaffold ready for the afternoon session. As I read this now, its so obvious to me that they were getting way too much at once. Even writing about it is way too much at once… but hindsight is 20/20. The students came back in the afternoon. I’ve never seen so much, go so wrong, so quickly! The students were completely confused and frustrated. There was a steady chorus of teachers (myself included) saying, “We told you this already!”; “You’re not listening to directions!”; “No.. you can’t look at you text features until you’ve decided as a group which subtopic going to be your focus!”; “You should be reading with your pencil down…” There were books and papers and pencils and more papers everywhere… and many teachers and students with their heads in their hands. It was a train wreck. Truly. I did what I always do in these situations. I reflected. Tomorrow I would have another group coming in for the same lesson and I knew things couldn’t stay the same. I decided that I had made two big mistakes with my presentation. First, I didn’t model the strategies for evaluating text features. I had given the students a list of questions on which to focus but hadn’t shown them how to do it. Second, my scaffold wasn’t clear. There were too many sections and too much text. I decided that I would use a slide on the projector to keep the students on track and make the sequence of the tasks more clear. The next morning when the groups arrived (different teachers than the day before) the morning went much then same as it had the day before. I had already talked to these teachers about how I was going to revise the lesson and try to learn from the day before. I spent part of the morning modeling some of the strategies that I wanted the students to use. My instructions were more clear and concise. As I anticipated the afternoon, I felt much better and knew that these students would be much more successful. The students came back in the afternoon and I went over directions one last time. I had my slide on the projector outlining the tasks for the afternoon. I sent them to their table with their heads nodding… yes… they knew what had to be done… they got it! …until they actually sat down and started to work. I watched as the whole train wreck repeated itself. These kids were just as confused as the others! “What am I looking for?”… “Should I be taking notes?”… “There’s nothing in this book [titled The Virginia Colony] about the government of the Virginia colony.” How could I have gotten it so wrong two days in a row? The students might be able to identify text features, but using them in a variety of real-life situations is another matter. I love teaching research. I literally get butterflies in my stomach when I begin a research lesson with my classes. I love the moment when they read something and make a connection. I love seeing their eyes light up because they get it! I’m so thankful for this train wreck because it will provide me with an example for other teachers, who don’t yet see teaching research the way that we do. Teaching research is more than handing a student a book and saying “Go.” What these teachers and I know is that teaching research is an active process. It’s slow and deliberate and messy. It’s a lot of work! So… “Thank you!” to my colleagues for sticking with me and with the process. Although we were all feeling some pain, we all came out understanding more about how our students learn. I’m so grateful that you have the energy and determination to see this process through. I’m so glad that you are not taking the easy way out. Mr. Schu (@MrSchuReads) has been traveling around the country giving away copies of The One and Only Ivan by Katherine Applegate (@kaaauthor). Today he posted this video created by students and staff at Harvard Elementary School who are reading The One and Only for their One Book, One School campaign. I’ve been immersed in Verdi. Our next faculty field trip is scheduled for tomorrow. Three of us are going to see the Pittsburgh Opera production of Verdi’s Aida. It’s more than three hours long. We’ll be sitting in peanut heaven. And… we’ll be competing against Steelers’ traffic. I can’t wait! Please realize there’s no sarcasm intended in the last statement. I truly can’t wait! The only music I’ve listened to in the last two weeks has been Aida. On my way to work, cleaning the house, mowing the grass, getting dressed. I have no idea what the libretto is actually saying. I can tell by the music that it doesn’t end well. Today, finally, I had he opportunity to read the synopsis. I love it! I wish I spoke (sang) Italian so that I could truly appreciate the musical genius that is Verdi. I almost regret that I have to see it, because I know that the instant the ensemble sings, “Emancipa!” or, “Radames! Radames! Radames!” those moments will be over and I’ll have only memories. So… anxiously awaiting (and simultaneously lamenting) tomorrow’s performance. I’m a huge fan of collaborative project based learning. This is a fantastic article about setting the tone for collaboration. Read this early in the year! I’m beginning to see more literature for children on this topic. Here’s a nice blog post from Pragmatic Mom with suggestions for book on this immigrant families. This is a faculty field trip I’d love to take! What fun would it be to tour the country and visit as many of these statues as possible? In this post Mr. Collins lists his “goto” websites. There are a plethora of interesting sites lessons and activities for a variety of age groups (leaning to the more advanced side for most.) FYI most of the sites are from the UK so you’ll see the word “maths” a lot. Interestingly this website is more about pollination and bees than sunflowers. Users of the site can upload data and observations. Includes teacher resources. I confess that I am a google maps/google earth newbie. I still prefer an actual map or atlas to a GPS. This is really cool though! Visit zoos around the world and virtually walk through them. Looking for some professional development for your commute? Try one of these podcasts. Both of the above links are from A Platform For Good.org. In this day and age, digital citizenship should be a focus in every classroom. I hope to use some of these resources as I plan instruction this year. Create polls on the fly and receive real-time feed back through text messaging or a custom URL. “Take the Tour” for a quick overview. Great for those EHUE teachers who don’t have Acti-voters. This will help you understand what an infographic is as well as help you create one from scratch. At EHUE we have a GlogsterEDU account. Glogster is an online presentation tool that allows you to create interactive multimedia posters. Here are some ideas for how to use GlogsterEDU in your class. This is an amazing app that allows creates an augmented reality version of a still picture. I think it’s like a cooler version of a QR code. I predict it will be the next big thing. Check out this blog post about using Aurasma in the music classroom. I think it would be interesting to use this with the children’s literature statues in the link above. Sources for my sources: Richard Byrne (@richardbyrne), Erin Klein (@KleinErin), Joy H.
The Great Unexpected by Sharon Creech. Realistic Fiction/Mystery/Folklore. Naomi and Lizzie find their friendship tested when a body falling out of a tree turns out to be Finn, a boy who captures hearts. Meanwhile, across the ocean, Mrs. Kavanaugh and Miss Pilpenny discuss murder and plot revenge. My Two Cents: It was very hard to assign a genre to this book. In some respects it felt like a mystery… Who (or what) is Finn? What kind of devious revenge are the spinsters planning? In some respects this felt like folklore/fantasy… Is Finn a ghost? What’s with all of the crows (rooks)? Is there really fairy gold? I think though that this is mostly a story about relationships, which I think makes it fall best under realistic fiction. Reading the themes and content above you may get the impression that this is a dark depressing book, but in fact it is not. For the many Sharon Creech fans out there, the writing won’t disappoint. She just has such a unique style that on every page I was delighted with her little gems of word choice. This was also a book I had a hard time putting down, for several reasons. Of course her word choice is incentive enough to keep reading, but I really loved Naomi, Lizzie, and all of the characters in the book. Naomi is down to earth and a little sarcastic (which I can always appreciate.) Lizzie is a little more needy and formal, and a chatterbox! They make an unusual pair, but when their friendship is tested you find yourself hoping that they will overcome the challenge. Finn is a charmer, and a mystery and the source of friction between the girls. The odd thing is that even after finishing the book he is still a mystery to me. The secondary characters in both Blackbird tree and “Across the Ocean” are just as interesting, each one with a unique quirk or personality. This book could be challenging for some readers. It is the kind of book in which you have to have a little blind faith that the confusion at the beginning of the story will work itself out by the time you reach the end. That confusion was part of what kept me glued to this book. I kept reading because wanted to make sense of the story. Creech is masterful in the way that she reveals essential plot points little by little along the way. This could work as a read aloud, but might be difficult because of the way the dialog is written (at times,) and the Irish brogue. Blashfield, Jean F. Ireland. New York: Children’s Press, 2002. Print. Burns, Batt. The King with Horse’s Ears and Other Irish Folktales. New York: Sterling, 2009. Print. De Valera, Sinéad. The Magic Gifts. Dublin, Ireland: Wolfhound Press, 2000. Print. Doyle, Roddy. A Greyhound of a Girl. New York: Amulet Books, 2012. Print. Krull, Kathleen. A Pot o’ Gold : a Treasury of Irish Stories, Poetry, Folklore, and (of course) Blarney. New York: Hyperion Books, 2009. Print. Spilsbury, Richard, and Louise Spilsbury. A Murder of Crows. Chicago: Heinemann Library, 2003. Print. White, Ruth. Way Down Deep. New York: Farrar, Straus and Giroux, 2007. Print. Mrs. Sikes shares information about books and the KBS media center.